I’ve said this before but am always happy to say it again: my favourite books are those where nothing happens, except that whole worlds change. Ray Robertson is brilliant at this seemingly nothing but really everything approach to storytelling, most recently in his novel, 1979. In a nutshell, the book is about a year in the life of Tom Buzby, 13 year old paper boy in small town Ontario. He has a mother, a father, an older sister, lives in an ordinary neighbourhood, has ordinary friends and pretty much lives the ordinary life of a thirteen year old paperboy in small town Ontario. That’s the bit where nothing happens. The yang being the part where whole worlds change, the part where you pay attention to life or you don’t. The book is about paying attention. 1— Tom Buzby goes about his ordinary life… ordinary for him, delightful for the reader… this is a kid who loves books and music and is having his horizons expanded in both departments. Being privy to his inner thoughts is a joy in itself… so honest are his meanderings it’s hard not to flinch a wee bit as we recognize our own young selves (especially if we, too, were kids who loved books and music and our own company and felt a little different, a touch insecure and out of step with all the ‘supposedly’ cool kids). Tom’s the kid with the North Stars when everyone else is wearing Nike. 3— And here’s the best part… characters we never meet, or meet very briefly, also go about their business. And we’re privy to that through regular interruptions to the the larger story by way of headlines and light journalistic type slice-of-life pieces (that you would love to read in actual newspapers) about people who appear in the book (and in our life) like extras in a movie. Those surrounding us in our communities, towns and cities, whether we know them or not, and whether or not we even notice them. What it seems Robertson has done is create his own version of Spoon River Anthology, by Edgar Lee Masters, a book that uses poetry to chronicle the lives of residents in a small town. Tom is introduced to the book by the friend of his older sister (and I’m introduced to the book by Robertson’s book, by this book). The process feels a little like what’s known as the Droste effect, where the image you’re looking at is holding the image of what you’re looking at and so on. 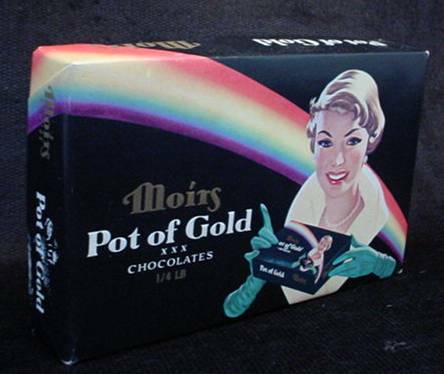 Like the old Pot of Gold chocolates cover. These headlines are the stories we’d like told about ourselves… or that would be so useful to know about the ‘extras’ on our own movie sets. The waitress, the cashier, the history teacher, the widower, the lawyer (who, hilariously, if you like lawyer jokes, pretty much has no story), the guy who whistles for no apparent reason, the Camaro that drives too fast down a side street. Even death gets its own headline, its own ‘voice’ through which it offers advice for the living, which could easily be cliche but doesn’t come off as such in this context. If anything, it’s a reminder. If you’re lucky, an epiphany. Robertson also nails the era through language, music, politics, clothing, food and drink, the change to metric, the way the indie corner stores slowly became Mac’s Milk and how the product lines, the shelving, the lighting just looked and felt so different. He conveys small town Ontario, with its factories and clotheslines, beautifully, and with a nod of obvious affection, which it so richly deserves and too rarely sees in literature. A small part of the book but not a small part of the story is Tom’s near death experience in a sewer, which everyone assumes he must have learned so much from but which wasn’t the case. “It felt as if I’d be letting them down if all I told them was the truth.” And therein lies the nub of it all, the thing every single one of us can relate to… this idea that on some level we’re fake, not good enough. As if the ordinariness of our lives just doesn’t quite cut it. 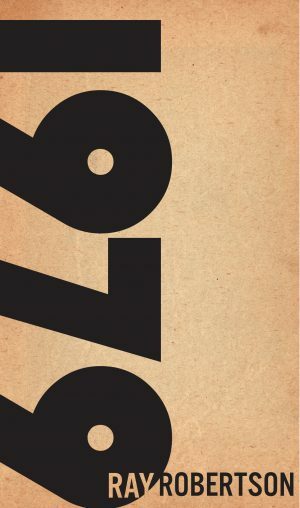 There are those who may only see 1979 as a book where not much happens… but they’d be missing the whole point. It’s actually more of a clever trick wrapped in a book and what it does most brilliantly is show us how we’re conditioned (in literature and in life) to notice only the shiny objects, the noise, to watch the magician’s hand, even though we know full well that’s not where the magic is. Ray Robertson’s 1979 , and Brother, by David Chariandy. Totally different books in structure, voice and experience, and yet… similar in how they successfully use place as character, the attention to details that are never over done, but feel true, and the surprisingly and sensitive perspectives of young boys boys who are not like everyone else around them. Great “not a review”! And I see you found your box of chocolates.